Read BONUS excerpt of Karen Stephen’s smashing new romantic suspense novel, MOTHER TONGUE, coming in Spring 2014, following the last chapter of Degrees of Obsession. If you are stalking a really good read, leap on this absorbing and insightful novel. 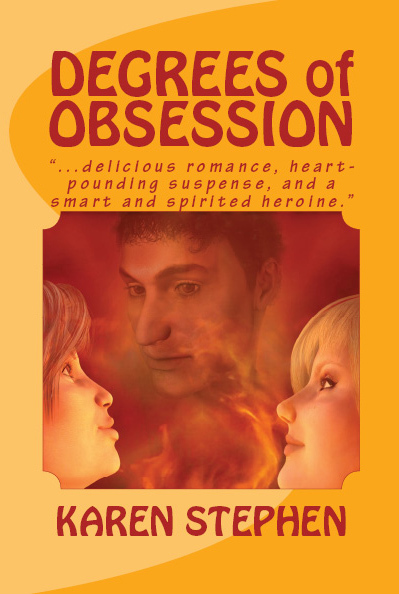 Degrees of Obsession has it all…delicious romance, heart-pounding suspense, and a smart and spirited heroine. Best of all, it shines light on the fears, follies, and fantasies that drive the choices we make in our lives, and on the love, in many forms, that redeems them.